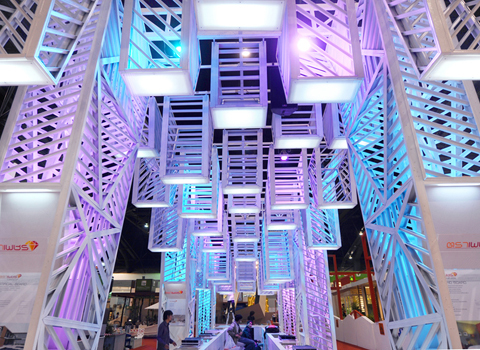 For the Bangkok Architect Fair in 2011, Apostrophy’s projected an aesthetic place, where you can leisurely sit and sip some beverages, surrounded by art pieces in gallery made from durably construction hardware products. 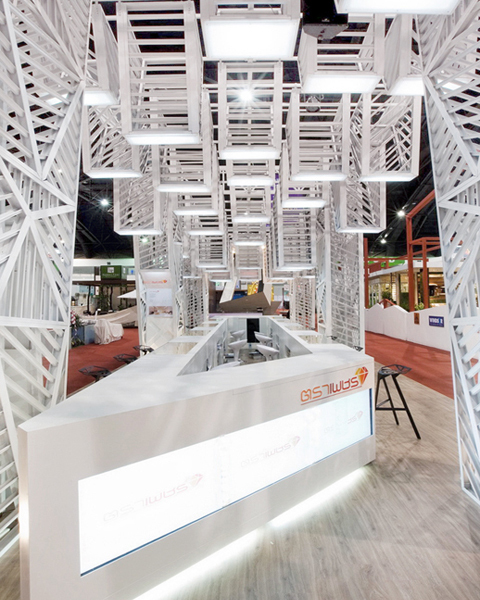 In Bangkok Architect fair 2011, another Apostrophy’s favorable circumstances from our companion, Diamond Building Products Public Company, their product lines are ceramic, laminate, construction hardware and construction service in Thailand. 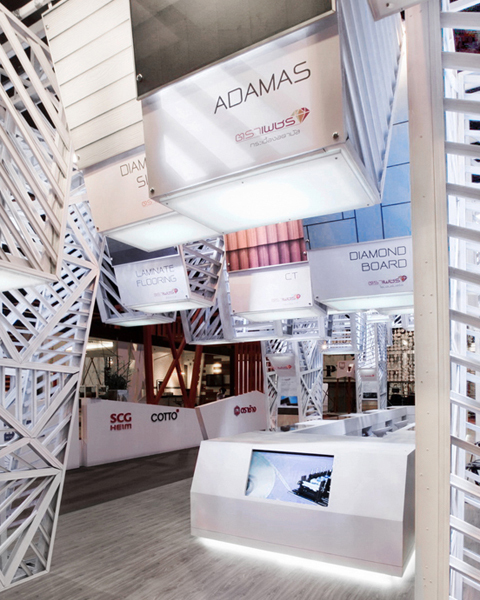 Apostrophy’s role play for this project is “artist” for concept “Diamond Art – Diamond Lounge” 2011. Imagine you walking into an aesthetic place, where you can leisurely sit and sip some beverages ,surrounded by art pieces in gallery made from durably construction hardware products. Furthermore, these inspire the visitors to create their own master pieces, home. 1) Create an 360º invitatory and friendly welcome approach for the visitors. 2) Bring out the atmosphere & space of “Sharing Lounge”. First, is between entrepreneur and clients, and then from clients to clients which leads to an interesting conversation or negotiation. 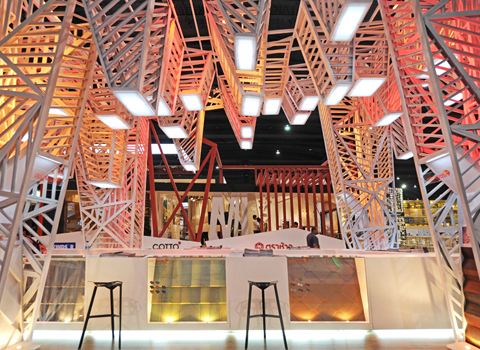 3) Valued added, inspire and display the construction hardware product like the art exhibition. This year, the primary reason of using Diamond Lounge space is to apply “HOW TO” of the “Purlin”, hardware for roofing,the highlight of their product launching this year. We transform its functional into the element of booth’s construction by “joint” the bent–angle of the purlin together. 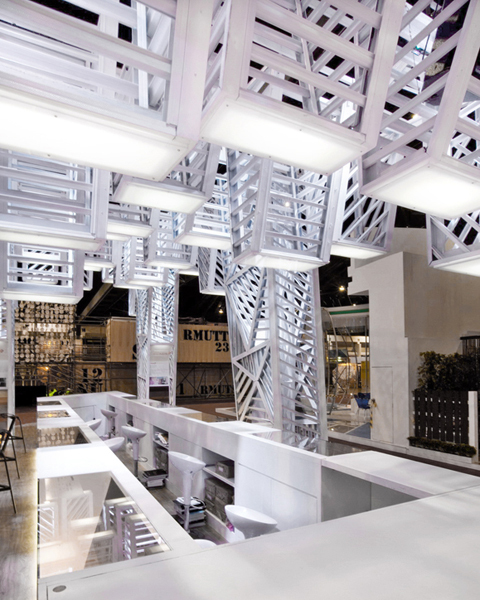 To describe the main structure, wall, huge lamp ceiling, it’s like we sketch the structure with clean white matt Purlin, appeared-shadow with the rhythmic of space & line of the structure, colour the pavilion with lighting, which we layered-hang LED PAR, fluorescent light box to create Lounge environment sense with our various programming pattern of lighting scene design, shown as dimension of Diamond Reflection. 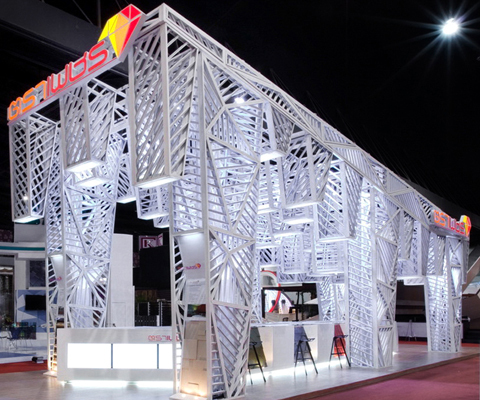 Considering for the visitor circulation and space, the reception, product display and bar, we use these functions profitably by linking all activities and product benefits together in every part of the construction. By blurring marketing techniques, in stead of “Direct-sale marketing and clients” , we convert into “Curators of the house hardware and the aspirant artists”. The products will be more easily to approach, to understand and to exchange the opinion. More obvious, you can see various types of ceramics beautified on the pole, can feel the texture of laminate floor while you are walking around and read the “art caption”, details of products, and have some fine discussions. 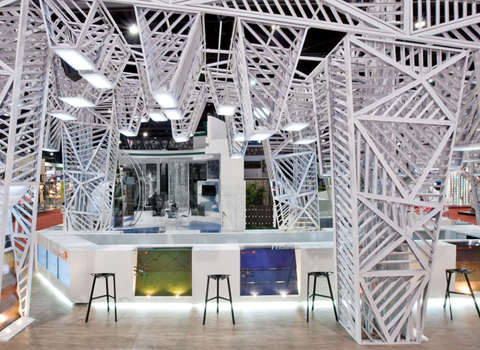 In conclusion, the Open plan design for continual circulation, intimate activities, product applied for main construction, decoration and lighting scene design, the reaction from all movements were expected not only to support product selling or be the highlight of the Diamond Tile Pavilion but also to be the landmark of sharing and sparkling the inspiration which is comparable to the Chandelier of Architect fair 2011.